Many of us have heard the buzz around mindfulness and how it can change our attitudes toward our daily lives. But what does it look like in practice when adapted to the workplace? To find out, I spoke with Pearl Waldorf, a licensed professional counselor in Portland, Oregon, about mindfulness at work and how it can affect our productivity. Waldorf defines mindfulness as “a capacity we all have to pay attention to what’s happening right here, right now, in the present moment.” Being mindful includes, for example, putting your phone away while talking to someone. Many people tend to confuse mindfulness with meditation, Waldorf says. But meditation is a specific task, whereas mindfulness is a general day-to-day mindset. Meditation can support mindfulness, but they are not one and the same. What is mindfulness in the context of work? When we’re stressed, Waldorf says, we often become frustrated and disengaged. When we practice mindfulness, we recognize those feelings and our reactions to them. Mindfulness in an office setting requires us to be in tune with what we’re feeling so we can make better decisions regarding our work. There are two basic mindfulness brain states we find in the workplace, Waldorf says. The first is execution, which occurs when we’re focused on one particular task. In this brain state, we are great at analyzing and evaluating problems. It’s the brain state we think of most when we think of work, as it’s more closely related to task management and completion. It’s that “flow” we experience when we work hard on a project all afternoon and only realize later that many hours have gone by. We can cultivate this capacity to focus, Waldorf says, to make sure distractions aren’t pulling us away from our priorities. In the workplace, this often means turning off email notifications and keeping our phones out of sight. The other is what Waldorf calls receptivity. This brain state has more to do with stepping back and looking at the big picture. This pause from execution is what allows us to take a break to find satisfaction from our work, which is what keeps a lot of us engaged in it over time, she says. “The reason these pause moments are so important is that those kind of a-has, the insights, the deep connections we can make around what’s really important in our work lives—that kind of clarity happens when we’re in an open receptive state,” Waldorf says. Waldorf also says many of us naturally find ourselves in one brain state much more often than the other. Someone who struggles with execution, for example, may be inundated with lots of ideas and feel bursts of creativity. But they likely have a hard time finding the focus to get the work done. They can feel overwhelmed and disorganized and unsure of their priorities. Someone who struggles with the receptive state is more likely to experience that hyper-work mode more often. That extended, laser-sharp focus leads to exhaustion quickly, as these people don’t take time to process accomplishments and acknowledge the ends of long-term projects. 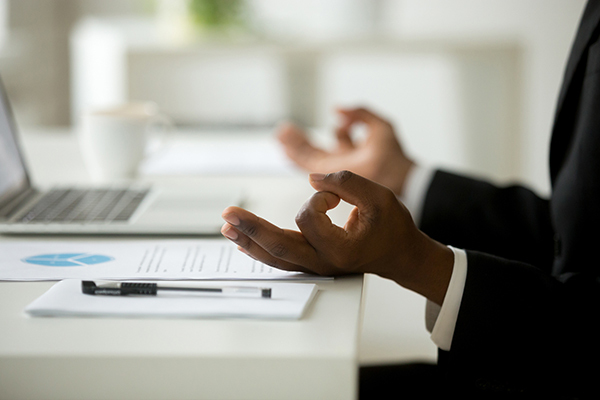 How can we cultivate mindfulness at work? Waldorf suggests starting with a simple awareness practice to encourage mindfulness at work. “Ask yourself: How do I feel? How is this going for me?” If you’re always answering that you feel stressed, overwhelmed, disengaged, or frustrated, then you know you have a bigger problem to address. But in general, the practices that will help depend greatly on where you find yourself on the mindfulness spectrum—from execution to receptivity—more often. To enhance execution, Waldorf suggests “focused attention practices.” A simple one involves taking a moment to pause and close your eyes, focusing on your breath. Naturally, we’ll get distracted here, she says. But when we do, we call our attention right back to the breath. Over time, even if we do this just five minutes per day, we’ll find it easier to focus on our breath longer. Exercises that support receptivity are known as “open awareness practices.” Instead of finding intense focus here, the goal is to “open the aperture,” as Waldorf puts it, and take in what’s around us. Again we close our eyes, but instead of focusing inward, we focus on the sounds around us. If we start to get distracted by interpreting what we hear—conversations between colleagues, for example—she encourages going outside to sit somewhere quiet where there is no language, only cars going by and wind rustling through trees. Ultimately, being mindful is about routinely checking in with yourself throughout your day and taking note of your current state. From there, we can do practices that engage whichever space we feel like we’re lacking at that moment. “Just being able to pause at some point during our day and notice our experience is very, very powerful,” Waldorf says. Even if that check-in shows just how stressed we feel, recognizing it gives us a chance to make a conscious decision on how to respond to that stress. Why should we encourage mindfulness in the workplace? “We want our employees to be responding to the challenges in the workplace as opposed to reacting to them,” Waldorf says. “So many of our problems in the workplace come out of reactivity.” Mindfulness supports time for a pause, she adds, in which we can thoughtfully respond instead. This is much better for our relationships, which are crucial at work. Mindfulness is also an important wellness tool, she says. Employees who are more in tune with themselves are more aware of the kind of support they need.